Chocolate Strawberry Bisquick Cake - Chocolate Chocolate and More! Chocolate strawberry Bisquick cake is a surprisingly moist flavorful cake that starts with baking mix. I saw some Bisquick in the store recently. For those of you outside the US, Bisquick is a baking mix that you can use to make pancakes or biscuits. When I was young, my mother didn’t cook. The only baked goods we had, came from box mixes. My sister and I were grateful for our box-mix baked goods. I know many people scoff at box mixes but they have their place. For those who lack confidence or skill, box mixes provide relatively foolproof alternatives to from scratch recipes. I read some time ago that kids today no longer learn how to cook so what we consider “simple” may not seem so to millennials. If you’re a busy mom who is pressed for time, throwing a few ingredients into a mix speeds up the process. I started making biscotti when my kids were young because you could over bake them with little consequences. So no judgement here. I haven’t used Bisquick since I left home so I picked up a box for old time’s sake. Then came the question of what to do with this box of mix. I wasn’t in the mood for pancakes and home-made biscuits are sooooo much better than Bisquick. I have to say though that Jiffy makes seriously good, cheap biscuit and corn bread mixes. They were staples in my college years. Hard to beat $0.25, an egg and some water for 6 cornbread muffins. Just as cheap as Ramen but better! 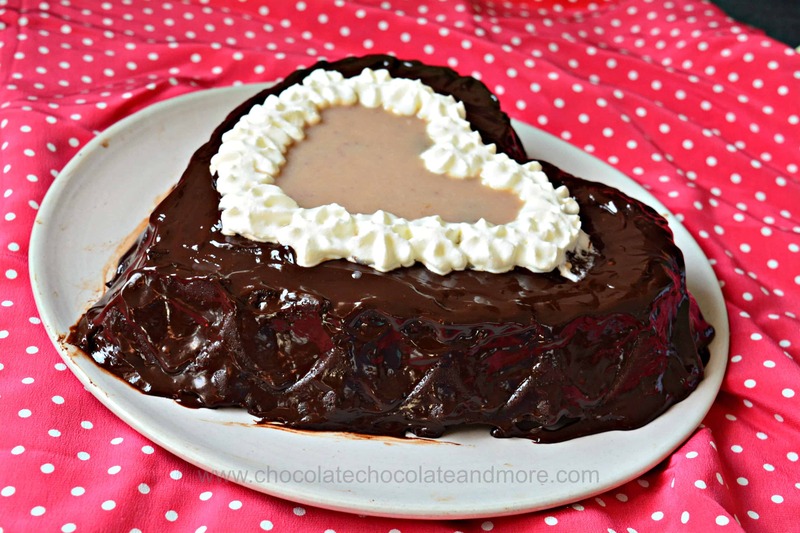 Valentine’s Day is coming up and I wanted to make a chocolate strawberry cake for my heart cake pan. I revised a recipe I found on King Arthur flour for gluten-free baking mix vanilla cake. The result was a surprisingly moist chocolate cake with a hint of strawberry flavor. I only added a cup of chopped strawberries because I worried about making the moisture content too high. I think you could add another half cup and be fine. If you want more strawberry flavor, you could also add a teaspoon of strawberry extract or add a tablespoon of strawberry jam to the batter. The texture of this chocolate strawberry Bisquick cake is also a little different from a typical cake. It’s more biscuit like (scones for you non-Americans). So it’s dense and a little coarse for a cake. Even so, my colleagues gobbled it up. I baked my cake in a Wilton heart pan. The decorative pattern was so pretty I could have just dusted my chocolate strawberry bisquick cake with powdered sugar and served it with strawberry sauce and maybe some fresh strawberries. I didn’t have any fresh strawberries to dress this up so I topped it with a dark chocolate ganache. 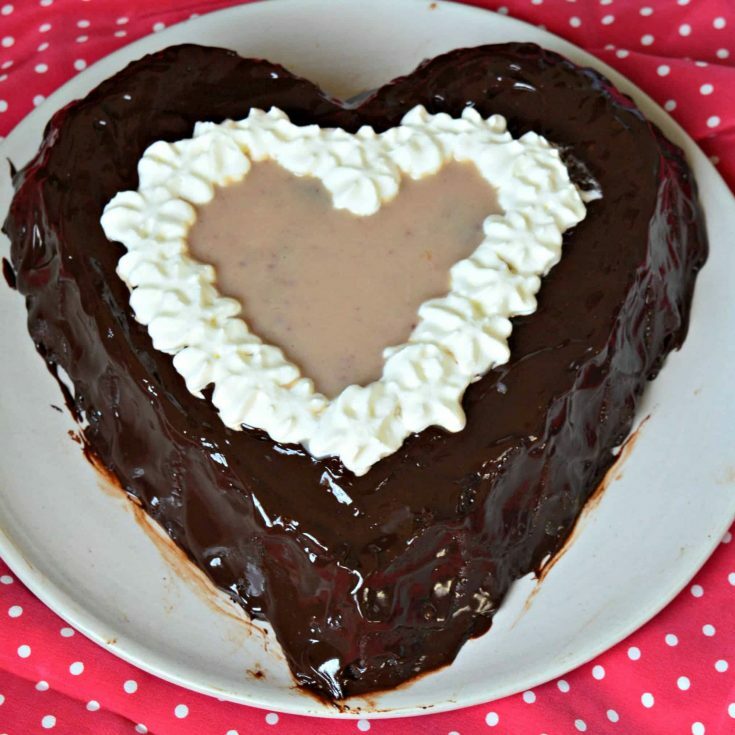 I tried to make the heart out of white chocolate strawberry ganache but my decorating skills are limited. So I used whipped cream (from a can) to cover up my rough edges. If you don’t have Bisquick, you can make your own biscuit mix with this recipe. Preheat the oven to 350°F. Grease a 13 x 9 inch baking pan or a 10" bundt pan. Cream butter and sugar until smooth. Add eggs one at a time, mixing until smooth. Pour into the baking pan and bake for 35-40 minutes for a 9x13 inch pan or 45-55 minutes for the bundt pan. Let cool to luke-warm before removing from the pan. Cover the cake with chocolate ganache or dust with powdered sugar. Put ingredients into a heat-proof bowl that fits on top of a large pot without touching the bottom of the pot. Boil a small amount of water in the bottom of the large pot. Turn the heat off and set the bowl on top. Let sit for 5 minutes. Then stir the chocolate and cream together until the chocolate is melted and the mixture is smooth. Put chocolate chips and cream in a heat proof bowl. Set the bowl on top of a pan of boiling water and turn off the heat. Let sit for 3-5 minutes and stir until chocolate is melted and mixture is smooth. Mix in the strawberry jam until smooth. You can add a little powdered food coloring if you want more pink color (liquid food coloring has too much water and may cause the chocolate to seize up).